Author’s note: this story was anthologized in Best American Science Writing 2010. Gene Brandi will always rue the summer of 2007. That’s when the California beekeeper rented half his honeybees, or 1,000 hives, to a watermelon farmer in the San Joaquin Valley at pollination time. The following winter, 50 percent of Brandi’s bees were dead. “They pretty much disappeared,” says Brandi, who’s been keeping bees for 35 years. Since the advent in 2006 of colony collapse disorder, the mysterious ailment that continues to decimate hives across the country, Brandi has grown accustomed to seeing up to 40 percent of his bees vanish each year, simply leave the hive in search of food and never come back. But this was different. Instead of losing bees from all his colonies, Brandi watched the ones that skipped watermelon duty continue to thrive. Brandi discovered the watermelon farmer had irrigated his plants with imidacloprid, the world’s best-selling insecticide created by Bayer CropScience, Inc., one of the world’s leading producers of pesticides and genetically modified vegetable seeds, with annual sales of $8.6 billion. Blended with water and applied to the soil, imidacloprid creates a moist mixture the bees likely drank from on a hot day. Stories like Brandi’s have become so common that the National Honeybee Advisory Board, which represents the two biggest beekeeper associations in the U.S., recently asked the U.S. Environmental Protection Agency to ban the product. “We believe imidacloprid kills bees — specifically, that it causes bee colonies to collapse,” says Clint Walker, co-chairman of the board. Beekeepers have singled out imidacloprid and its chemical cousin clothianidin, also produced by Bayer CropScience, as a cause of bee die-offs around the world for over a decade. More recently, the same products have been blamed by American beekeepers, who claim the product is a cause of colony collapse disorder, which has cost many commercial U.S. beekeepers at least a third of their bees since 2006, and threatens the reliability of the world’s food supply. Scientists have started to turn their attention to both products, which are receiving new scrutiny in the U.S., due to a disclosure in December 2007 by Bayer CropScience itself. Bayer scientists found imidacloprid in the nectar and pollen of flowering trees and shrubs at concentrations high enough to kill a honeybee in minutes. The disclosure recently set in motion product reviews by the California Department of Pesticide Regulation and the EPA. The tests are scheduled to wrap up in 2014, though environmentalists, including the Sierra Club, are petitioning the EPA to speed up the work. For over a decade, Bayer CropScience has been forced to defend the family of insecticides against calls for a ban by beekeepers and environmentalists. French beekeepers succeeded in having imidacloprid banned for use on several crops after a third of the country’s bees died following its use in 1999 — although the French bee population never quite rebounded, as Bayer is quick to point out. Germany banned the use of clothianidin and seven other insecticides in 2008 after tests implicated them in killing up to 60 percent of honeybees in southwest Germany. 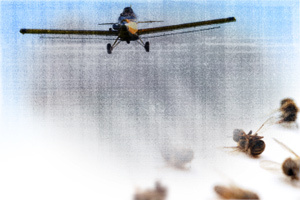 Imidacloprid and clothianidin are chloronicotinoids, a synthetic compound that combines nicotine, a powerful toxin, with chlorine to attack an insect’s nervous system. The chemical is applied to the seed of a plant, added to soil, or sprayed on a crop and spreads to every corner of the plant’s tissue, killing the pests that feed on it. Pennsylvania beekeeper John Macdonald has been keeping bees for over 30 years and recently became convinced that imidacloprid is linked to colony collapse disorder. It’s the only explanation he can find for why his bees, whose hives border farmland that uses the pesticide, started dropping dead a few years ago. Scientists continue to investigate the causes of colony collapse disorder. Leading theories suggest a combination of factors that include parasitic mites, disease, malnutrition and environmental contaminants like pesticides, insecticides and fungicides. The current EPA review will provide further insight into the role of pesticides, as it will uncover whether honeybees sickened by exposure to imidacloprid spread it around by bringing contaminated nectar and pollen back to the hive. Imidacloprid was approved with knowledge that the product, marketed as Gaucho, Confidor, Admire and others, was lethal to honeybees under certain circumstances. Today the EPA’s own literature calls it “very highly toxic” to honeybees and other beneficial insects. Its workaround was to slap a label on the product, warning farmers not to spray it on a plant when bees were foraging in the neighborhood. In its 2007 studies, Bayer applied standard doses of imidacloprid to test trees, including apple, lime and dogwood. Its scientists found imidacloprid in nectar at concentrations of up to 4,000 parts per billion, a dose high enough to kill several bees at once. (Honeybees can withstand a dose of up to 185 ppb, the standard amount it would take to kill 50 percent of a test population.) What caught the attention of California agricultural officials was that the test trees contained the same amount of deadly imidacloprid as the citrus and almond groves regularly sprayed by farmers, and pollinated by bees. (California’s almond industry has increased its use of imidacloprid by a factor of 300 in the past five years.) Agricultural officials were also surprised to learn that the imidacloprid can persist in the leaves and blossoms of a plant for more than a year. The Bayer results don’t surprise University of California at Davis professor Eric Mussen, a well-known entomologist and one of the country’s leading experts on colony collapse disorder. Mussen has seen a variety of unpublished studies with similar results, including one at U.C. Riverside that found imidacloprid in the nectar of a eucalyptus tree bloom at concentrations of 550 ppb a full year after it was applied. Mussen adds that ongoing research into chronic exposure to insecticides will be crucial. It’s likely, he says, that exposure to even low doses acts like a one-two punch: It can weaken the bees until a parasite or pathogen moves in to finish them off. As the EPA begins its pesticide studies this year, skeptics wonder whether the agency can conduct an unbiased review. Back in 2003, they point out, the EPA reported that clothianidin was “highly toxic to honeybees on an acute contact basis,” and suggested that chronic exposure could lead to effects on the larvae and reproductive effects on the queen. Although the EPA asked Bayer for further studies of its effects on honeybees, it nevertheless authorized the chemical for market. Colangelo envisions a similar scenario in coming years. The EPA has announced it will review clothianidin and other chemicals in the same family, but not until 2012. In the meantime, there’s nothing stopping the agency from approving the insecticides for use on new crops based on existing policies. In the end, Colangelo has little confidence the federal agency will bring a hammer down on the agribusiness giant. The EPA, he explains, often keeps its test results confidential for proprietary reasons at a company’s request. As a consequence, it’s unclear where gaps or discrepancies occur until a company makes a disclosure similar to Bayer’s. Halting the sale of pesticides, though, would be no mean task. Over 120 countries use imidacloprid under the Bayer label on more than 140 crop varieties, as well as on termites, flea collars and home garden landscaping. And the product’s patent expired a few years ago, paving the way for it to be sold as a generic insecticide by dozens of smaller corporations. In California alone, imidacloprid is the central ingredient in 247 separate products sold by 50 different companies. In a statement, the EPA says that before banning a pesticide, it “must find that an ‘imminent hazard’ exists. The federal courts have ruled that to make this finding, EPA must conclude, among other things, that there is a substantial likelihood that imminent, serious harm will be experienced from use of the pesticide.” The EPA did not clarify what is meant by “imminent hazard” and why the death of honeybees does not qualify.